(CNN) -- Baseball scouts found Hank Aaron hitting cross-handed in Mobile, Alabama. They found Mickey Mantle outrunning the wind in northeast Oklahoma. They even found a former drug addict and felon turned outfielder, Ron LeFlore, in a Michigan state prison. "We are very happy. This is a big opportunity," Rinku Singh says of his new job. The latest discoveries are from the countryside. The Indian countryside. Two pitchers, both as rural as hay, are now working for the Pittsburgh Pirates. Rinku Singh and Dinesh Patel are the first baseball players from India to sign a professional baseball contract. "Sir, we are very excited," Singh said with stunning reverence compared with most American 19-year-olds. Both have thrown the ball past the vaunted 90 mile per hour mark on a radar gun. Their passage from India began with a reality show, "The Million Dollar Arm" competition, staged from Mumbai to Delhi. Los Angeles, California-based sports agent J.B. Bernstein got the idea that somewhere in a country of 1.1 billion people, they could find humans who could throw the ball 85 mph or better. The winner of the contest would get to come to America to learn how to pitch. For the Indian men, many meal-skipping poor, baseball represented a chance to throw their way out of poverty. More than 37,000 competitors crossed rivers, walked, rode, drove and bicycled over paved and unpaved roads and dirt paths. They pitched in all sorts of unconventional manners, often a hurl of the baseball in a modified cricket style. "We even had a guy in Bangalore named Babu who drove a three-wheeler cab," Bernstein explained. "He threw 81 miles per hour barefooted. He actually made it to a tie-breaker to qualify for the finals but ultimately was eliminated." Singh and Patel, two former javelin throwers who picked up a baseball for the first time this year, changed their lives with throws faster than 85 mph. Goodbye to villages where their parents earn about $25 a week, hello to training in Los Angeles. "The biggest surprise here, sir, is the rules of the road here," Patel said, alluding to India's dangerous driving. "People respect safe driving here." The young men arrived in the United States to work with a master, Tom House, the University of Southern California pitching coach. House has a Ph.D. in psychology, preaches pitcher-specific strength drills and taught Nolan Ryan, Randy Johnson and other legends of the craft. "The idea is that getting somebody brand new, with no bad habits, would be easier than trying to teach somebody to undo bad habits," House said. House adds that already, the pitchers are good mentally and physically. So House is teaching his pupils the art of deception, changing the speeds of their pitches, throwing to different locations: high and tight, low and outside. 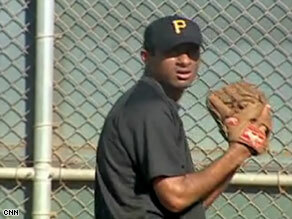 "We have learned three pitches: breaking ball, fastball and change-up," Singh said. "We are very happy. This is a big opportunity." It's also high-voltage culture shock. Halloween with horrifying costumes, drunken revelry and women in various states of undress blew the minds of the Indian pitchers, both are Hindus raised on reverence and modesty. "I couldn't believe the first time I saw Halloween here," Patel said in astonishment. "I saw students in crazy costumes. People were going crazy." House says his pupils will have to get used to the customs of baseball, from being asked to knock down a hitter with an inside pitch to knowing not to waste throwing a curveball on a three-ball, one-strike count when up by 10 runs. "That's going to be their hardest adjustment," House said. "It's going to be a cram course. They'll figure it out and probably have their feelings hurt or be confused early on." But House predicts that the amiable pitchers will be embraced and soon learn about spitting sunflower seeds, or putting shaving cream in an unsuspecting teammate's cap. "Baseball is a funny game," Patel said with a smile, flashing teeth as white as a newly unwrapped baseball. For the pitchers from India, the levity of baseball diamond got interrupted by the terror being played out on television as they watched the details of the recent Mumbai terrorist attacks on CNN. "It is very sad," Singh said. "We just pray for everyone in India." The young men are back at home in India now, where they say they are fortunate that none of their loved ones was killed or hurt. Once they return, they will eventually wind up on the mound in Bradenton, Florida, for Pittsburgh Pirates spring training. When Singh and Patel face their first opponents off on some practice field, no doubt the echoes of Tom House will be heard. "So you wanna throw hard," House urged. "Think hard. Think hard thoughts." The pitching guru will also steer them through those times when an ornery coach might live up to the Housian theory of baseball being a kid's game run by negative adults in a culture of misinformation. "The really good thing is, they're not going to understand 90 percent of the negativity." House said. "My mom used to say ignorance is bliss. So their lack of understanding of the politics of the game will be a plus for them." Between games, Singh and Patel won't be eating cheeseburgers on the road, as cows are sacred to their Hindu beliefs. It's on to the world of pro baseball, sidestepping tobacco juice and the smell of new leather gloves. The baseball scouts have found two true country boys from India, who both have great arms and cows as pets.